Why are Venn diagrams useful? Venn diagrams works only for two or three sets, but not for four because 4 circles in the plane do not divide the plane in 16 regions. 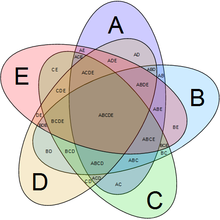 Venn diagrams are useful only because axioms of Boolean algebra can be written using only three variables, thus allowing for a diagrammatic representation of each axiom. I have made a similar observation elsewhere: Coxeter groups allow a powerful level of visualisation because all relations between their canonical generators are in some explicit mathematical sense two dimensional. However, their educational value is limited. And this is a link to Branko Grunbaum. Thanks, it is an useful reminder. 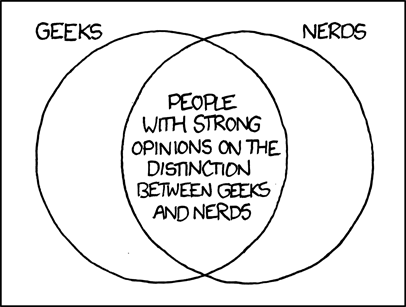 Venn diagrams do have some educational value though. The regions demarcated by the ellipses are the atoms in the free Boolean algebra on generators, and finite unions of those regions give all elements of the free Boolean algebra. It’s nice to have concrete pictures of formal facts like these. Venn’s novel contribution, and why we remember him still, was to include a boundary quadrilateral around all the circles, enabling visual representation of the complement of a set. No one had done this before him, and he did it at a time when there was great discussion and contention among statisticians about the appropriate definition of “a population” in undertaking statistical inference. Personally, I would not call your second diagram a Venn diagram, since the diagram border is not explicitly drawn. @peter: of course, you are right. There are related mathematics and algorithms problem here, for those who love mathematics / algorithm problem solviing Mathalon , after all whats in mathematics without problems. Hemant asks “whats in mathematics without problems”. In fact, mathematics is the science of structure and pattern. Problems are a distraction from this, and from the subject’s main purpose. Let’s stop teaching math through problems, and let’s ditch the macho competitiveness that an unwarranted focus on problem-solving has led us to. Peter, I agree with you entirely. Unfortunately, Hemant is not asking anything. He’s spamming the comments section of the latest post of every math-oriented weblog he can find. And he’s a terrible human being for it.